With the winter season just around the corner many skiers are eagerly awaiting the opening off resorts. If you are looking for lift served skiing your options are the glaciers at Tignes and Les Deux Alpes and maybe l’Alpe d’Huez if the temperatures drop or a trip to Saas Fee, Zermatt or Soelden. There is an alternative. Last week’s first real snows enabled ski tourers to head to the hills to get in some early season turns.on the Col du Galiber and Ouillon and even on the closes pistes of the Chamrousse ski area. 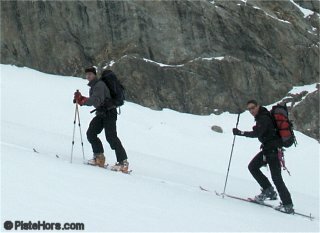 Read our introduction to ski touring and learn how you can free yourselve from the whims of ski resorts opening dates.